The WORX 18″ 15-amp electric chainsaw is a lightweight but robust and powerful equipment that’s ideal for easy, quick tasks around the farm or yard, such as clearing brush, cutting firewood, trimming trees, etc. Moreover, it never generates hazardous emissions and has little operating expenses when compared to chainsaws that run on gas. In this article, we’ll take a look at the WORX 18″ chainsaw’s features, advantages, drawbacks, and determine if it’s the best electric chainsaw on the market now. What Makes WORX Electric Chainsaw The Best? With the WORX 18″ 15-amp, you are unlikely to have the headaches that are usually synonymous with other chainsaws. Operating the tool doesn’t require lumberjack-level expertise. WORX 18″ 15-amp’s auto-tension mechanism comes with an oversized, single knob to secure the chain and bar and automatically maintain proper tension when in operation. The auto-tension system also extends the chain and bar life by negating any possibilities of over-tightening. The WORX 18″ 15-amp is sufficiently powerful to perform the toughest tasks, offering a maximum horsepower of 4.0. The electric chainsaw also provides hassle-free, gas-free functionality. This electric chainsaw differs from gas-powered saws as there is no need to mix gas and oil or put up with tough startups. The WORX also has an automatic oiler, which offers constant lubrication for both the chain and bar. The saw has an oil reservoir to indicate oil level. For comfort and safety, the chainsaw is equipped with an inbuilt safety chain brake, which halts the chain as soon as improper contact is done, offering protection during kickback. The safety mechanisms such as the cutoff switch and chain brake provide a novice user the much-required confidence to use the saw. You will need not buy an additional chain, bar oil, heavy-duty extension cord, etc. as the chain would remain sharp and the cord will stay in immaculate condition even after felling a big tree completely. In fact, chain tension is a problem you’ll almost never come across on this chainsaw. The WORX 18″ 15-amp works like a charm even after being unused for a year or two. This makes the chainsaw quite reliable. This electric chainsaw offers you almost the same power and performance a gas-powered unit offers, but at a much lower price. The saw doesn’t make as much noise as a gas-powered saw, but it’s not completely silent. You would still require some form of hearing protection when using this tool. In case the chain loops go bust, which is quite unlikely, you may have a tough time finding a replacement. This chainsaw is not a professional logger tool. If you’re looking for one, look elsewhere. The WORX 18″ is definitely not a chainsaw for all. As aforementioned, if you cut trees for a living and not do it as a hobby, you should look for more powerful, gas-powered chainsaws. 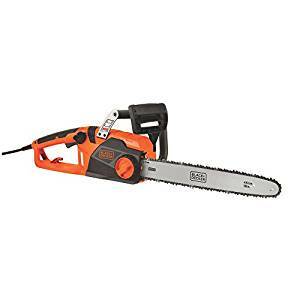 However, if your requirements aren’t of that large magnitude, you’ll not find a better electric chainsaw than WORX 18″, especially at this price. It’s efficient, non-fussy, durable, reliable, and is versatile enough to be handled even by amateurs. Long story short, the WORX 18″ electric chainsaw won’t meet your expectations; it would exceed them by a huge margin.